GeoBlue Trekker is designed to provides travelers with comprehensive international health and accident insurance for multiple trips throughout the year. An unlimited number of international trips up to 70 days for each international trip. The Trekker Multi-Trip is an annual insurance policy used by individuals, families and employees. One policy for 12 months, covering you for an unlimited number of international trips. The annual premium is also a big reason for it’s popularity, for individuals up to age 50 the annual premium is only $175 for the annual policy. 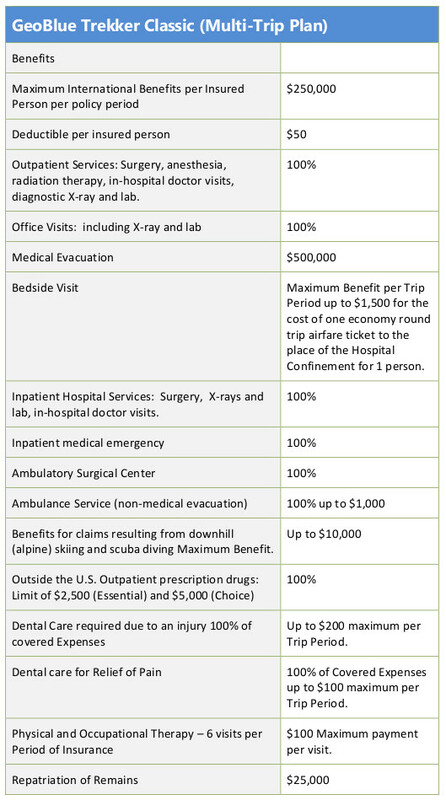 GeoBlue Trekker is an annual international medical policy covering anyone who travels globally multiple times per year. Insurance – Even if you are already enrolled in a health plan, your coverage is limited when you travel abroad. In fact, your plan may not pay to have you safely evacuated if you are critically ill or injured. Information – Where do you turn to learn which hospitals and physicians meet your standards? Keep up with breaking news about health and safety threats? Translate key medical terms and brand name drugs? Access to quality care – How do you find western trained, English-speaking doctors with the appropriate skills? How do you arrange a convenient appointment? Each GeoBlue Trekker policy includes broad, deep and reliable Global Health and Safety Services easily accessed through the web or our toll-free customer service center. We are so confident in our products that we offer the best guarantee in the business! If you are not completely satisfied with your purchase, notify us in writing indicating your desire to cancel. If you have not departed on your trip before the date of the communication, you will receive a full refund. Strength of a U.S. Insurer – Underwritten by 4 Ever Life Insurance Company, rated A- Excellent by A.M. Best. 4 Ever Life is an independent licensee of the Blue Cross and Blue Shield Association. Better Coverage – Our plans have met the standards of state regulators and feature coverage more generous than plans sold as “off-shore” surplus coverage by foreign, non-admitted insurers. FOr example, our plan covers every trip taken, up to 70 days in length, in addition, we do not impose pre-certification penalties for hospitalization. Lastly, we provide coverage for pre-existing medical conditions and injuries related to a terrorist act. A Better Kind of Care – Global travelers can leave home feeling confident that a trusted source of care is available at a moment’s notice – no matter what town, country or time zone. Travel anywhere knowing that if your health is a concern, getting good care is not. Trekker Coverage Start Date – The insured person’s coverage under the GeoBlue Trekker plan for a trip during the period of insurance starts for a scheduled trip to a Foreign Country, when the insured person boards a conveyance at the start of the trip; and notwithstanding the foregoing, no coverage is in effect for a trip unless the insured person is scheduled to spend at least 24 hours away from home. Trekker Coverage End Date – The insured persons coverage under this plan for a trip ends for a scheduled trip to a Foreign Country, when the insured Person alights from a conveyance at the completion of the trip; and in no event will coverage for a trip extend past the Maximum Trip Coverage Period of 70 days. Nothing contained in this plan restricts or interferes with the Eligible Participant’s right to select the Hospital or Physician of the insured person’s choice. Also, nothing in this plan restricts the insured person’s right to receive, at his/her expense, any treatment not covered by this plan. Outside the U.S. – GeoBlue has a network of doctors that includes almost every specialty you may need in over 180 countries. Only a small fraction of doctors around the world meet GeoBlue standards – participation is by invitation only. We seek out professionals certified by the American or Royal Board of Medical Specialties who speak English, and we factor in recommendations from over 140 Physician Advisors from all over the world. Then we assemble in-depth profiles so our members can choose with confidence, and we put formal contracts in place to ensure patient access. Once they’ve seen you, GeoBlue doctors bill us directly so you don’t have to file a claim. Find doctors worldwide, fill a prescription, forward your ID card, view translations, where are high risk areas, understand what immunizations you need for the visited country, and much more. GeoBlue coordinates emergency services with a worldwide network of contracted Physician Advisors as well as air ambulance operators selected for their safety records. Members in need of life-saving medical intervention are treated in Centers of Excellence in the U.S. and around the world whenever possible. GeoBlue maintains a 24/7, toll-free call center to assist GeoBlue members with everything from routine requests to medical emergencies. The GeoBlue staff has years of experience with international medical assistance and has close working relationships with it’s international provider Community. While traveling across the globe with the GeoBlue mobile app, you can quickly and conveniently find and access quality care using your mobile device.